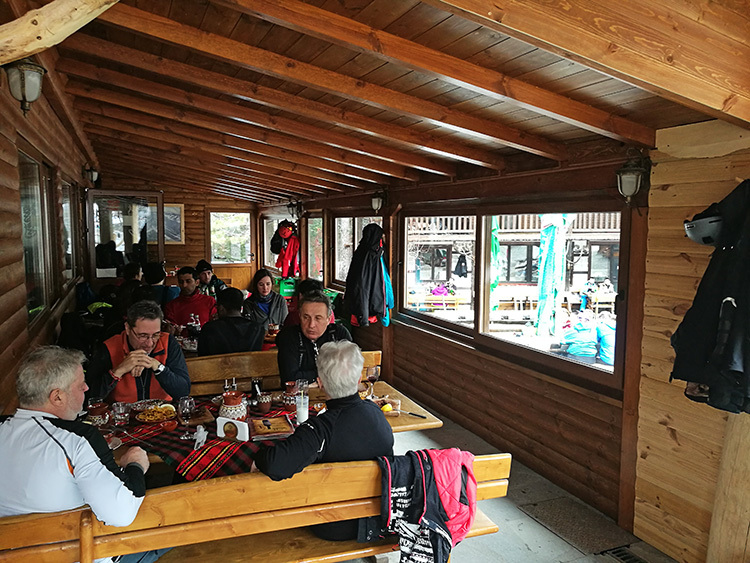 Restaurant “Peshterite” is one of the few privately owned establishments in the Bansko ski area. It’s located on the main Ski Road, just after the exit to the Chalin Valog ski area, but can also be reached by car. Thanks to its location, this restaurant is a great choice for an afternoon break in between skiing or on your way back to the hotel. The best part is that prices are cheaper than those in restaurants run by the resort management and the food is just as good, if not better. 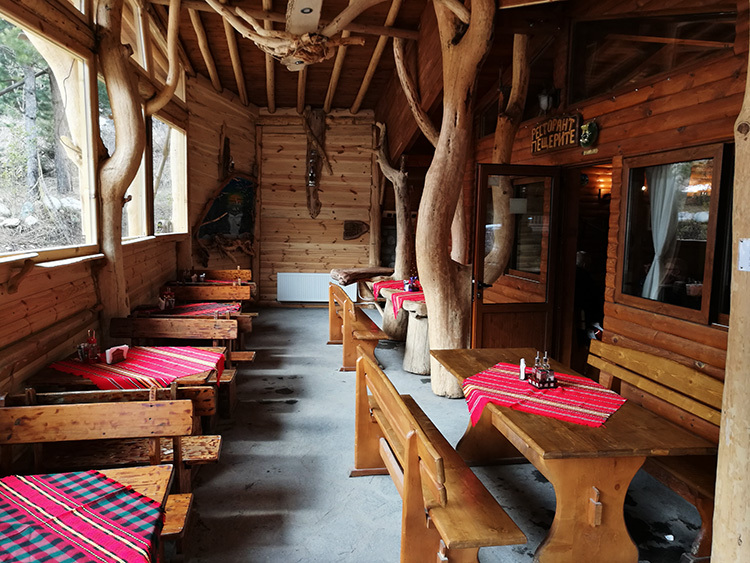 The wooden style of the restaurant is very authentic for Bulgaria, but also has a modern touch. There are plenty of tables inside and outside, but it can be full during the February high season. If you’re planning on eating lunch and heading back to the slopes, you’ll need to ski down to the end of the Ski Road and take the gondola back up. During the high season there is a chance you’ll need to wait in line for the gondola even in the early afternoon, so during that time, it might be best to leave this restaurant for when you’re heading home afterward, as to avoid waiting to get back up to the slopes. The name of the restaurant means “The Caves” and it comes from the caves located near the restaurant. Eating on the slopes in Bansko. Even though the menu isn’t big compared to many other restaurants in Bansko, you’re bound to find something to suit your taste. The emphasis is on traditional Bulgarian foods, such as grilled meats and some local dishes. On the menu, you’ll also find salads, soups, appetizers and a variety of drinks. Like we mentioned earlier, prices are much cheaper than in the restaurants located in the main ski area. If a soup costs you 8-10lv in one of those, in “Peshterite” the price is only 3.50lv. Salads are between 5lv and 7lv, while a beer is only 3lv. This is half the price of a beer in the Bla-Bla restaurant located next to the Shiligarnik lift. A full meal in “Peshterite” (beer, soup, main dish, salad and some bread) will cost you about 20-25lv, while for the same menu you’ll pay 40+lv in one of the restaurants owned by the resort management. Prices in many restaurants in the town itself will be cheaper, but not drastically cheaper. The meat you’ll find in restaurant “Peshterite” is some of the best. One of the delicacies is horse sausage. Yes, you read that correctly, a sausage from horse meat. Other than being extremely tasty it’s also high on irons. 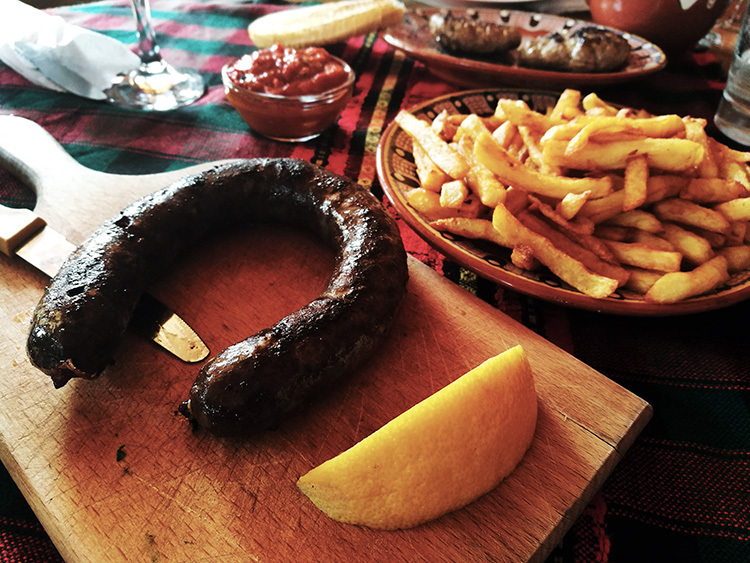 Another specialty is the Banski Starets, which is a local dried sausage, best accompanied by a glass of wine or rakia (Bulgarian brandy). As a side dish, the french fries are extremely good here.